LeftyBassist.com • View topic - Looking suggestions for pre-amps for "stereo" bass rig. Post subject: Looking suggestions for pre-amps for "stereo" bass rig. I'm looking to put a modest 2 channel bass rig together. Practice/small gigs. Think Rick-o-sound with a dedicated amp channel per pickup. To begin with, I have a stereo 100W RMS per channel solid state power amp in a flight case. There is empty 1U panel room in that case for another rack containing a couple of pre-amps side by side. Assume I might want to use it in an average bass gig or as a soloist. I'll be building the pre-amps myself. Anything is possible, including tube types. At the moment, I'm leaning towards copying some Sansamp DI types. Apart from the usual tone & drive controls, there won't be much panel room for extras like compression, but I'd lean towards using pedals for fx. If the pre-amp has distortion, I prefer growl to fuzz. Keen on hearing what other folk would like. 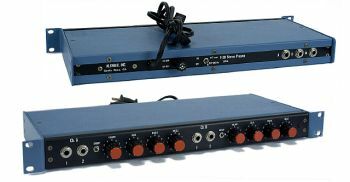 Post subject: Re: Looking suggestions for pre-amps for "stereo" bass rig. Maybe I'll clone an Alembic F2B? That would fit perfectly. F2B was going to be my suggestion too. Cheers guys, the more I look into it, the more I like the F2B for the job. The F2-B pre-amp is mostly finished. One big problem is the output does not match a modern power amps input. The tube output is from too high an impedance as well as having a very large signal level. Apparently, the original production was for use with power amps that had a higher input impedance (>200k) than the more usual 10k-20k we have now. In an attempt to make the output suit either a power-amp, or a normal instrument amp input, I fitted 22k output level pots fed through 180k resistors (making the pre-amp "see" the 200k-ish load it was meant to). However, with everything maxxed, it only just tickles the red peak indicators in my power amp. So, I'm going to add additional balanced output drive using op-amps - pretty much the same driver circuit that Sansamp use for XLR output. It ought to be a very useful piece of kit - very good basic sound for guitar or bass. Has some tricks - you can channel link to run both sides off a mono input, series link to drive one side from the other. Having 2 identical channels makes it great for checking and comparing pre-amp tubes side by side. I've got a modest stash of old British ECC83 to sort out - Mullard, Brimar etc. ...Has some tricks - you can channel link to run both sides off a mono input, series link to drive one side from the other. Having 2 identical channels makes it great for checking and comparing pre-amp tubes side by side. I've got a modest stash of old British ECC83 to sort out - Mullard, Brimar etc.